Lazy Pineapple: In my Friend ,I find my second self. Can we really say that in today's world? In the thirst for moving upwards in our careers and and the race to be "successful" ,"liked by all" and the desire to have more....we have forgotten when life was simpler and friends were friends. Its so much easier to make friends and be a friend to somebody when you are younger and life is still uncomplicated.Friendships are the anchor and the life saving rafts in times of need.Hanging out together is the essence of it and so is just being what you were.There is no need for having any ulterior motive to being a friend. As we grow older and life thrusts more and more responsibities on us....the pureness of it all disappears.Then it all becomes a game of what you can gain from being a friend to someone.Expectations are high and pretenses even higher.Then it becomes tougher to identify true friends from this herd of so called "friends". Its not that there are no lasting friendships....but any realtionship including friendship involves investment of time, emotions and caring.It takes a lot of effort to maintain true friends and time is luxury ,most of us can't afford.In this whole process, many a times ,good friends are lost or forgotten and we are left with superficial relations. All of us should take a step back from this high speed race called "life" ,and remember, how it was when we were not bogged down by so many demands and desires.Its now ,when we should reflect on our Future and how it will be without a circle of people who accept you for what you are.Stand by you, when you are lonely and disappointd.In short simply be...a FRIEND. 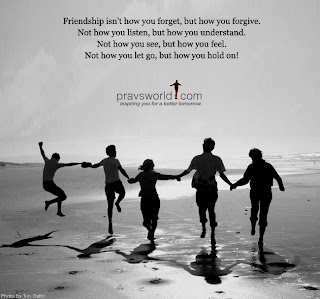 meaning of friendship is different to different people..
one felt sad when having expectation from friensds..
Its experience which we learn in our life..
Its accassions we experience in our life..
friend is always a friend if taken as a frind and respected as a friend and responded as a friend..